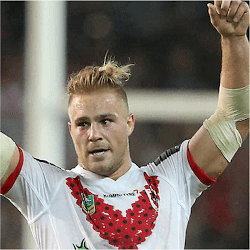 St George Illawarra Dragons lock Jack de Belin hit a speed-bump in his preparations for the 2017 season last week, when he fell during training and landed awkwardly on his wrist. At first, scans did not indicate an injury, but a second round of tests revealed a fractured scaphoid, one of the eight bones making up the wrist. The 25-year-old, who chopped off his trademark man-bun to cries of dismay from some fans in November, had surgery to insert a pin in the bone, and as a result has been told to lay off wrestling or ball-skills training for a month, as he prepares for the rugby league pre-season. Good news for fans and punters, however, is that he is expected to be fighting fit again by the time the NRL season kicks off, so he’ll be able to do his bit for the Dragons in the 2017 Premiership, as they attempt to wrest the title from the Cronulla-Sutherland Sharks. The Sharks will be equally determined to hang on to it, as it’s the first they’ve won in 50 years. De Belin is still hard at work, concentrating on leg strength and cardiovascular training at present, but he has had to abandon contact and ball-skills for now. He told reporters he would “ease into” both those areas again “in time”, indicating that he and his doctors may have different ideas about what constitutes a month.